There are federal laws in place to ensure that residents are treated with the dignity and care that they deserve. The overarching federal authority for the treatment of residents is the Nursing Home Reform Act of 1987. In this Act, residents are provided rights such as the right to be informed of changes in their medical treatment, the right to be treated with dignity, the right to be free from abuse and neglect, the right to be free from physical or chemical restraints and the right to receive confidentiality in the maintenance of patient records. According to the data collected by Medicare, there are currently 304 nursing homes rated in Oklahoma monitored by the federal agency through inspections, investigations and surveys. 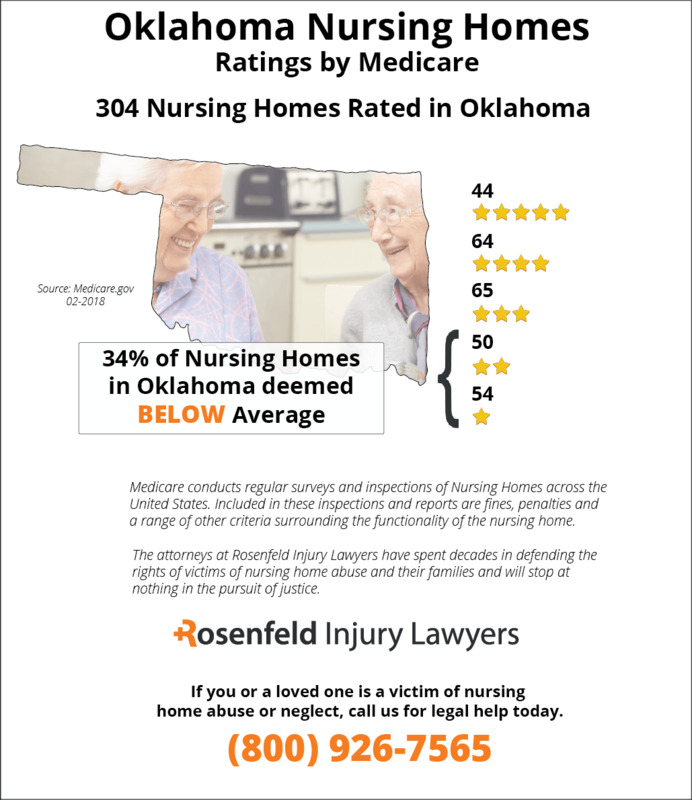 Of these, 104 (34%) Oklahoma nursing facilities are deemed to be below the national average because investigators found serious violations and deficiencies that led to resident harm and wrongful death. 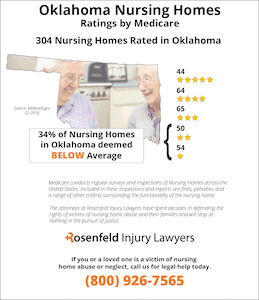 If your loved one was injured, abused, mistreated or died unexpectedly through neglect while residing at an Oklahoma nursing facility, we encourage you to contact the Oklahoma nursing home abuse & neglect attorneys at Nursing Home Law Center to discuss your compensation claim through an initial, free case consultation. There are also state laws in Oklahoma that provide additional protections for residents in nursing homes. The Protective Services for Vulnerable Adults Act is the main legal authority for residents in the state. This Act puts forth the procedure that is in place for handling reports of neglect and abuse. If one suspects that a person is being subjected to abuse or neglect in a nursing home, then he or she must file a report with the appropriate authority in Oklahoma. 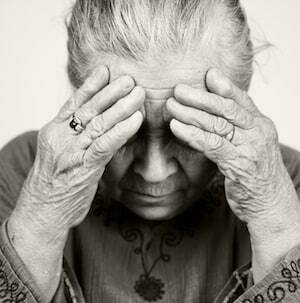 If a vulnerable adult is at a substantial risk of suffering immediate harm, then it is vital to file a report of neglect or abuse. All too often, residents can be harmed as a result of the failure of an individual to file a report. 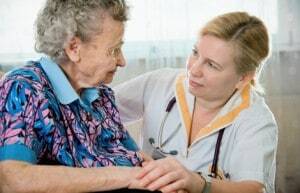 Nursing home workers may believe that they will not be caught in abusing or neglecting a resident, so they continue to engage in these heinous acts until a report is finally filed. By knowing the legal rights of nursing home residents, you can take action when it is necessary. It is important to understand that the way in which the law functions is to provide nursing home residents with the broadest rights possible under federal and state law. By knowing this, you will not be persuaded that it is okay for a nursing home to engage in abuse of a loved one. You should trust your gut when a loved one complains about harm or shows physical signs of abuse or neglect. Take action to file a report so that you can know everything was done to protect the legal rights of your loved one. If you are unsure of how to proceed in filing a report of abuse or neglect, then you can get in touch with Oklahoma nursing home injury lawyers today. The skin can develop a bedsore from restricted blood flow to the area when the weight of the patient’s body pushes against a pad, chair or mattress. Limiting the amount of blood minimizes the delivery of oxygen to the skin and underlying tissue. When the affected area is deprived of oxygen, the dermis and epidermis layers of skin can start to die or be permanently damaged. Our Oklahoma nursing home negligence attorneys regularly represent individuals and families in lawsuits against facilities where a pressure sore developed or worsened. All of our cases are handled on a contingency fee basis where there is only a legal fee charged when there is a financial recovery for you. Complete the contact form here for a free case review. The nursing staff is duty bound to provide each patient premium healthcare around-the-clock. This includes performing routine skin inspections to look for any signs of developing sores. In its initial stage, a pressure ulcer will appear as a fluid filled blister with red dots or an inflamed area that feels cooler or warmer than the surrounding tissue. At the first sign of a developing bedsore, it is essential to alleviate the pressure. Within days, the wound can heal completely. However, if the area is left unattended, it can easily progress to an advanced stage where a small crater develops, exposing fat deposits. After the crater of an advancing wound appears, it can easily develop into a life-threatening stage as the area becomes susceptible to a skin infection (sepsis) or bone infection (osteomyelitis). At its most critical stage, the crater deepens to expose bone and muscle below. Without effective antibiotics, the patient can easily die from a compromised immune system. All advanced stages of a developing bedsore can be eliminated through routine skin inspections. Doctors treating decubitus ulcers use a variety of procedures including debridement where the dead or dying tissue is cut away from the wound. This is why most facility-acquired pressure sores are considered to be caused by negligence at the facility. With proper treatment, the wound could have easily been prevented or not allowed the opportunity to progress to a crucial stage. When the nursing staff routinely adjust the patient’s body every two hours or less, the potential of developing a bedsore is nearly eliminated. Successful nursing homes with a good track record usually follow scheduled turning and readjusting protocols for every mobility-challenge patient. This is because many bedridden and wheelchair-bound individuals are unable to reposition themselves without assistance. Because nearly every type of pressure ulcer is preventable, any sign of a loved one in a nursing home suffering a bedsore is typically an indicator of negligence by the medical team. Negligence is often the result of improperly trained medical staff not following proven protocols to minimize the potential of developing a sore. As a result, many families with a loved one suffering a bedsore will hire an Oklahoma pressure ulcer attorney to stop the negligence immediately. Fill out the form here to contact an Oklahoma pressure ulcer attorney from the list below. These law firms accept nursing home negligence cases on contingency and provide legal services to help stop the abuse and assist families seeking financial compensation for damages.